Polymer clay is a wonderful thing for crafters and knitters can use it to make customized buttons for their garments. 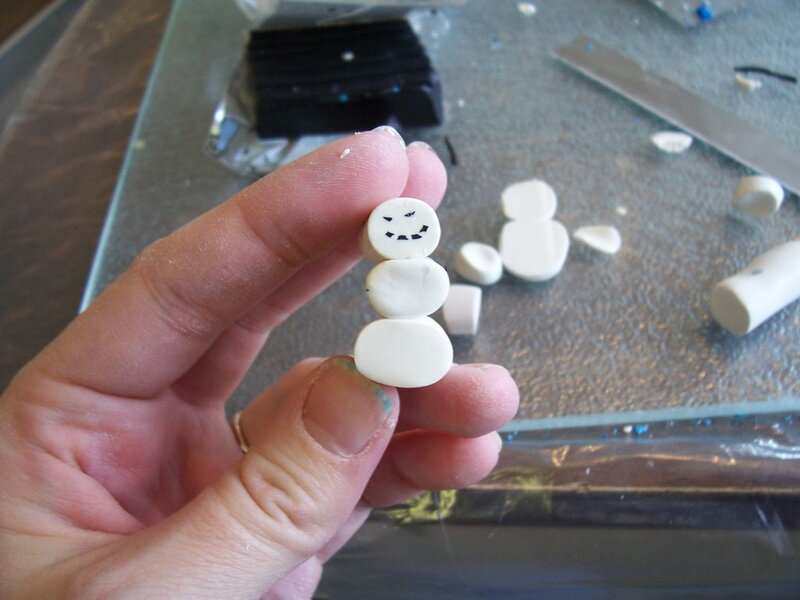 I am going to make buttons for the snowman vest and I'm going to show you how I do it. Almost every polymer clay book out there has the same technique (called "caning") that I'm going to use. 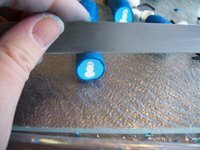 It's taken from glasswork and you can use it to make many very detailed, nearly identical buttons. 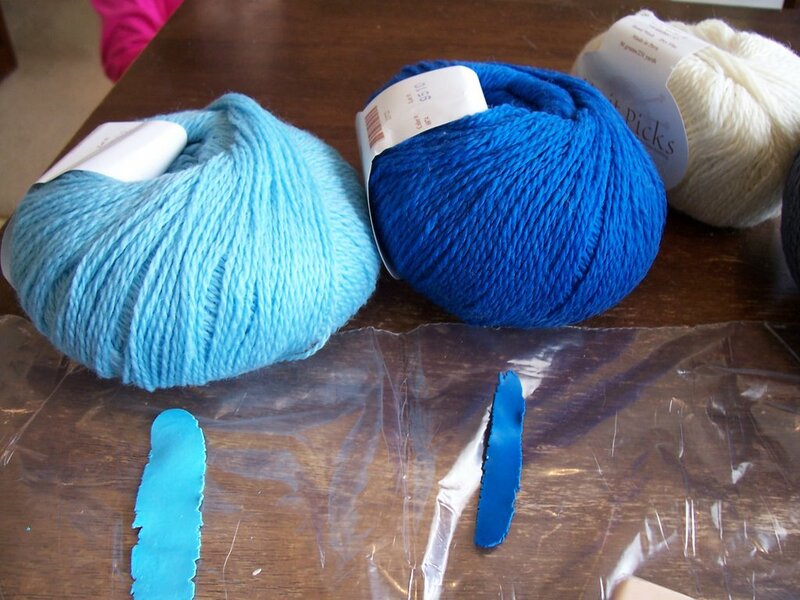 The first step is to match the blues for the buttons. These are the colors I wanted to match. I used blue and white to match the left and blue and a little black to match the dark blue. Easy. I then made up larger amounts. This is how to make the snowman face. 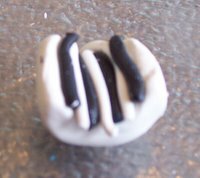 I started with a hollowed out tube of white and added white and black strips for the smile. I then added more white and strips for the eyes. Then I rolled the cylinder to make the snowman face. I then added two white body cylinders. 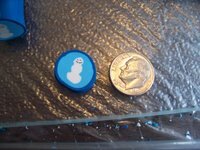 I surrounded the snowman with light blue and then dark blue. 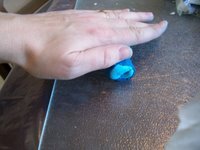 Then, I rolled the cylinder down to about the size of a dime. It's ready to be cut. And we have buttons. I cut about 25 off the cane and I poked holes to sew them onto the vest and cooked them according to package directions. Those buttons will be great! 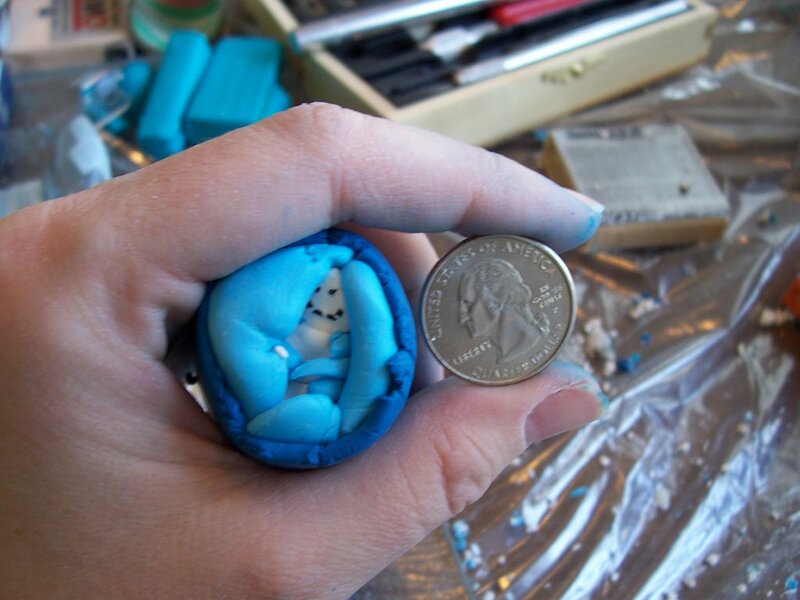 I haven't done a ny caning with polymer clay, but I shall have to give it a try at some point I'm sure! Thanks for the tutorial! Very cool and cute Ali! Thanks! Wow! That is a very neat process indeed, thanks so much for the photo tutorial I want to try it sometime to make buttons. Yours came out perfectly! Does the clay remain durable after prolonged use as well? Oh my goodness- that is way, way, way neat!!!!!! You are really, just too cool Alison. Wow, can you believe I've never seen that done before! I thought each button was made individually, and I always wondered how people made several that looked so alike! That is really going to look great on the vest! That is a really neat technique. Wow! i'm always amazed at how that works. and why the clay doesn't get all messed up. And you do PMC?! You floor me with your talents! Those buttons are gonna be so cute. Wow! You make it look so easy! I ordered the yarn to make the snowman vest for myself. Probably won't get to it until next year, but I love the pattern. Can't wait to see your finished with those lovely buttons. that's incredible. i would be scared out of my mind to smush such a perfect-looking snowman into a tube of blue. 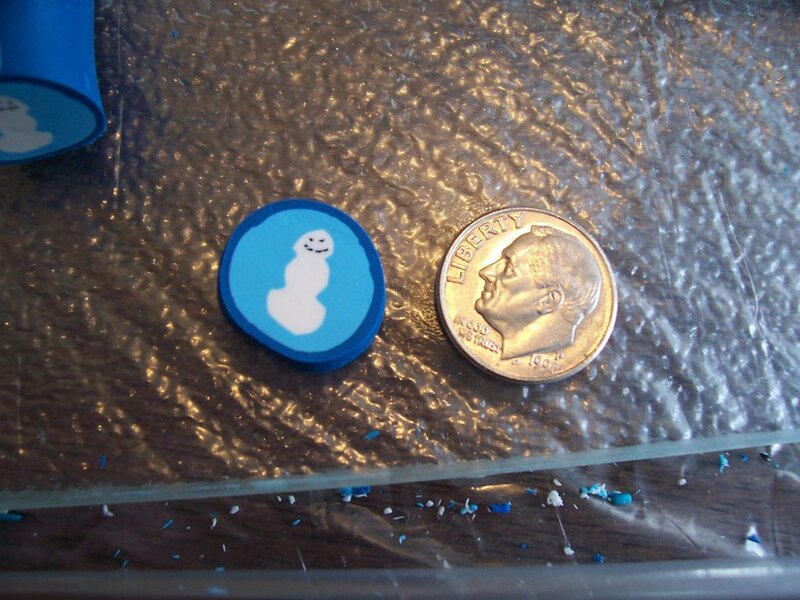 but the tiny snowmen are still perfect! good job! That's really cool - thanks for sharing!